The Code.org site (see here) describes some of the successes of CSEd Week. Over 81 million people tried the Hour of Code. President Obama became the first US President to program (see Forbes piece). I’m sure that there were a lot of outreach activities going on in Georgia, too. I wasn’t involved in those. I want to report on two points of progress in Georgia that was more at an infrastructural level. All the high school IT/CS classes in Georgia can now be taught by teachers with Mathematics or Science certifications. Previously, only Business Education and Mathematics teachers could teach AP CS, and only Business Education teachers could teach other IT/CS classes. (Even though AP CS counted as a science credit, science teachers couldn’t teach it.) Now, it’s all open. It’s much easier to teach Math and Science teachers about CS than Business Education teachers. 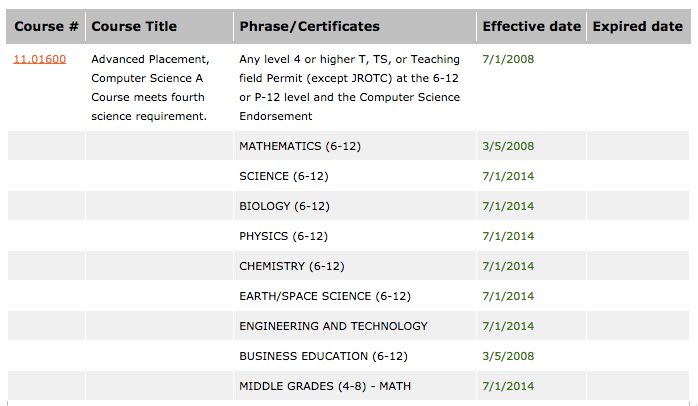 Now, we have a much larger pool of possible teachers to recruit into CS classes. I’m grateful that Georgia House Representative Mike Dudgeon took this from the Georgia Coding group and made it happen. On Thursday, I hosted a Transfer Summit at Georgia Tech. We had 15 attendees from 11 different institutions in the University System of Georgia, some two-year-mostly institutions and others four-year degree institutions. The goal was to ease transfer between the schools. This was a strategy that CAITE used successfully to increase the diversity in computing programs in Massachusetts. Two year programs are much more diverse than universities (see some data here), but only about 25% of the students who want to transfer do so. Part of our strategy with ECEP is to set up these meetings where we get schools to smooth out the bumps to ease the transition. I learned a lot about transfer at this meeting. For example, I learned that it’s often unsuccessful to have students take all their General Education requirements at the two-year institution and then transfer to the four-year institution, because that leaves just intense CS classes for the last two years — no easier classes. At some schools, the pre-requisite chains prevent students from even getting a full load of just-CS classes, since students have to pass the pre-req before they can take the follow-on class. At the end of the meeting, we had 9 new transfer agreements in-progress. Some of the participants had come to a similar meeting last year, and they said that they were able to make more progress this year because they knew what to have ready. Wayne Summers from Columbus State actually came with a whole new agreement with Georgia Perimeter College (a two-year institution) already worked out and ready to discuss with GPC representatives. I was grateful that GPC brought three faculty to the meeting, so that they could have multiple agreements worked out in parallel. Getting math and science teachers into high school CS classes and helping students in two-year institutions move on to bachelors degrees isn’t as flashy as the Hour of Code and programming at White House. Teacher certifications and transfer agreements are important when we move beyond the first hour and want to create pathways for students to pursue computing through graduation. Here in Georgia, the Technology Association of Georgia (TAG) in cooperation with other groups in Georgia are promoting a “Day of Code” on December 10. See here for more on that, including information on prizes available for classes and schools. I wrote up a report on our Summit on Computing Education in South Carolina for Blog@CACM (and here’s the link back to my original post on the summit). It went well, in that we got the kind of attendees we wanted and had the kinds of discussions we wanted. I was particularly pleased with the energy up through the final session. Barbara Ericson did a nice job of collecting a bunch of URL’s to resources for new Computer Science teachers, and then created a PowerPoint tour of them. I’ve posted these on a new Resources for New CS Teachers page here on the blog. I learned a lot at the Summit. The issues in South Carolina are different from the ones in Georgia, and they’re different again in Massachusetts and California. That’s what’s making this ECEP Alliance work interesting and complicated. What’s interesting is that we’re starting to see some common themes. I wouldn’t call these experimental results, since you can’t easily do experiments comparing states. Instead, these are some observations from our first four case studies. Having a statewide organization is an enormous advantage: We work in California through Debra Richardson who heads up an organization called ACCESS with an Executive Director focused just on CS Ed in the state, Julie Flapan. ACCESS is about making computing education policy reform happen in California. That’s a huge advantage — a single point of contact to other efforts, a coordinating point for the state. We started work in South Carolina because of IT-oLogy, a public-private partnership for advancing IT. 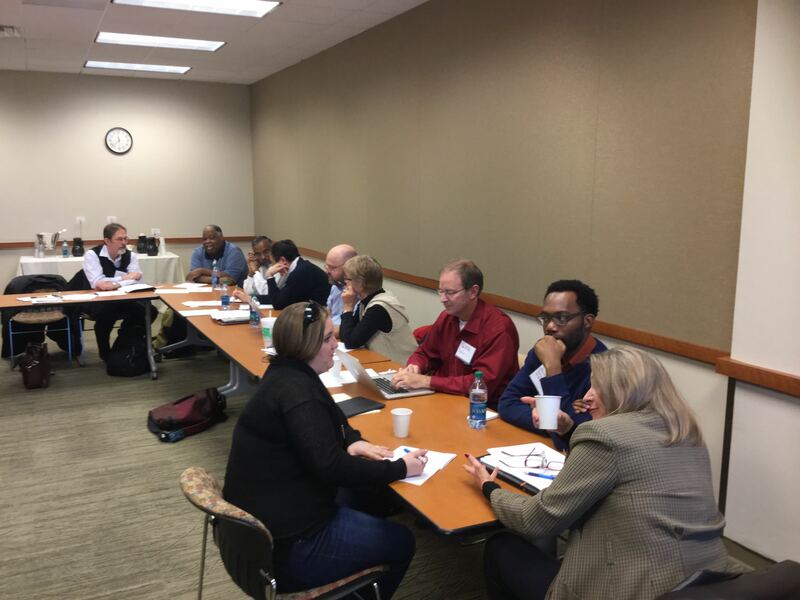 As we started planning for the summit, we realized that we need more connections, so we formed a Steering Committee with representatives from across the state, from the Department of Education, to high schools, from Universities to private industry. That Steering Committee was very helpful in getting the word out about the summit and helping us to understand the issues when assembling the program. Statewide meetings and summits help to make things happen: We launched the higher education part of Georgia Computes in 2007 at a meeting for CS department representatives from across the University System of Georgia. The summit in South Carolina has really got discussion going there (here’s a nice piece in the Columbia The Free Times after the summit). Massachusetts just held a statewide meeting of everyone offering CS professional development across the state. These meetings aren’t a waste of time — they get people focused on the issues, at high-bandwidth, and attract attention to the issues. We’ve already been contacted by people in other states who want to organize similar summits. A full-time statewide organizer is key: We couldn’t have done what we’ve done in Georgia without Barbara Ericson. Having full-time staff has similarly been key in Massachusetts, California, and South Carolina. Maybe you could you get a state to reform its computing education without a full-time person, with volunteers contributing their time. We’ve just seen how valuable it is to have a professional being the point of contact and focusing on making change happen. As part of my Cyber Monday advertising email onslaught, I got this interesting ad from the National Academic Press (not a phrase one often writes). They have a whole series of books on STEM role models for girls, including this one on Cynthia Breazeal, roboticist. Have any of you read these? Do you recommend them? Cynthia Breazeal is a creature creator. Armed with electronic gadgets, software programs, and her endless imagination, she creates lifelike machines that can respond to the world around them. Cynthia Breazeal is a roboticist, a scientist who designs, builds, and experiments with robots. As a child, she relied on movies to see robots in action. Now robots are part of her daily life at the MIT Media Lab. There, she and her students use their computer science and engineering skills to work on marvels like Leonardo, a robot that interacts with people in ways that seem almost human. Cynthia s other world-famous projects include Kismet, an emotionally intelligent robot that smiles, frowns, and babbles like a baby. Why create robots like these? Cynthia can picture a future where sociable robots exist to benefit people. She works hard every day to turn that dream into a reality. Firsthand accounts from Cynthia and from those who know her best combine to tell the inspiring story of a curious, sports-loving girl who went on to become a worldclass roboticist. Robo World is also a Captivating story of high-tech invention where the stuff of science fiction becomes real in today’s labs. via Robo World: The Story of Robot Designer Cynthia Breazeal. Nice to hear that computing education will be at SXSW. “Current trends show a loss of student interest in computer science careers and degrees across the U.S., especially among women and minorities, even though the need for qualified candidates in this field has never been greater. Across the country, computer science experts, computer science educators, researchers, and even policymakers are developing initiatives that address these problems. via SXSWedu Panel Discussion – Engaging Students with Computer Science Education | ain’t what it used to be. The linked article below provides results I’ve seen before — that the average income of college-educated is much higher than the non-college-educated. I had not yet seen the below claim: Most inventors and entrepreneurs, the individuals who impact economic growth, are also predominantly college educated. The model of the college-dropout entrepreneur is the exception, not the rule. This is important for computing, too, where our model of the dropout CEO of the startup is legendary — but really rare. If you want to create a computing company, you’re best off getting computing education. via The Economic Value of Education | Brookings Institution.